If you are music lover, then you wouldn’t spend a day without listening to the beautiful melodies in your laptop while working. Also, the premium quality of MacBook speakers will help you watching movies where you don’t have to compromise with the original audio experience in the theatre. But if you are dealing with damaged speakers and still doing nothing about it? Then you probably haven’t heard of our Laptop Repair World where we offer good services regarding all branded laptops especially MacBook and other technical gadgets. You don’t have to carry your whole gadget to get your internal speakers replaced when you can simply detach your speakers and get them to us. Though you can connect external speakers, all these days of comfy usage of internal speaker’s experience cannot be replaced with it. So, we always recommend you to bring here before damaging it further. Are your Inbuilt speakers not working? 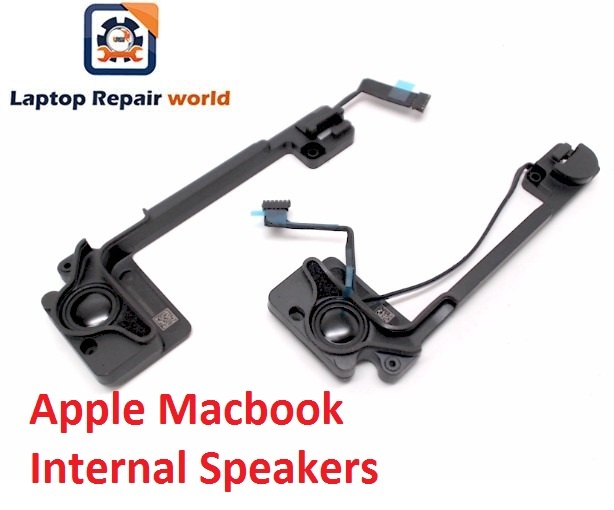 don’t worry, we have new genuine Apple MacBook Pro and MacBook Air Speakers in stock, we can replace new internal speakers at the best price. There are good repair and replacement facilities in the market, but getting it at a price as cheaper as you can avail at us is simply not possible. We not only give you the product at a lower price but also the repair charges are very minimal. Our workers who are experts in handling your devices not only improve the quality of the gadget but also they suggest you and keep instructing you regarding the product replaced and other technical updates that enhance your user experience. Every mini component we replace with the damaged product are nothing but the original branded items and never disturb the gadget like the cheap replacements. Every customer who visits us will have a fruitful experience in revisiting us as there are good discounts for them and other offers where they are given any additional gifts and other valuable services. Ping us online or offline through calling or visiting our store and try contacting us to get to know us more clearly.